Ssam as in the famous Momofuku Ssam Bar means a wrap, and jang means a sauce. 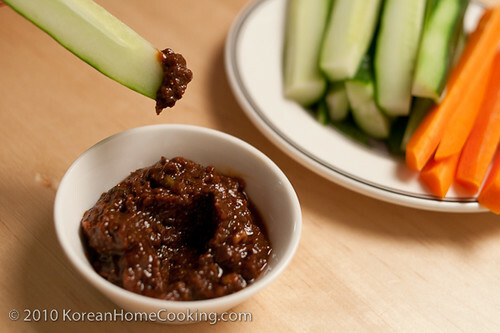 Ssamjang, literally translated as a dipping sauce for wraps, is an indispensable part of Korean BBQ and also makes a healthy dipping sauce for vegetables. 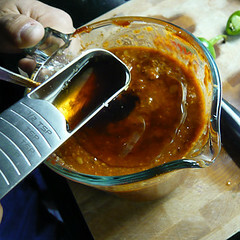 There are many ready-made ssamjangs sold in market these days, but nothing beats home-made ssamjang like this one. This special recipe comes from my mother-in-law's kitchen. This recipe makes multiple servings. You can store them in the refrigerator for up to 1 month. 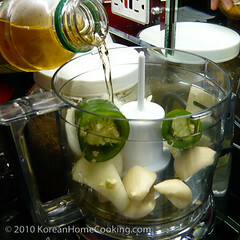 Blend the onion, garlic, jalapeno and red pepper with apple juice in a mixer. Combine the mix from Steps 1 and 2. 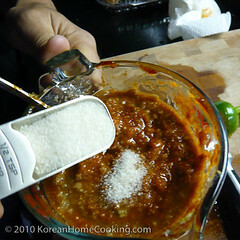 Add sugar to the mix from Step 3. 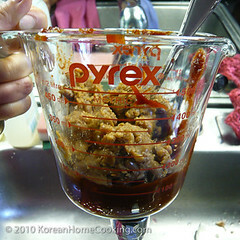 Add sesame oil and mix thoroughly. because i see the other one doesnt use apple juice..which one is better.. 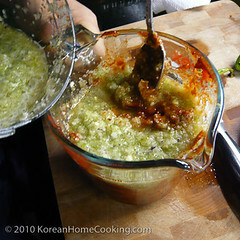 Among the two different ssamjang recipes I have posted here, I prefer the one with apple sauce because it adds sweetness and moisture. I see a lot of differences color of samjang in the restaurants I wonder why? Some are red, some are brown and some are dark brown to nearly black. Is the different type of dwenjang used? Or what?